It's Meyer lemon time in northern California. This being one of our two favorite citrus fruits, we celebrate by immediately cooking something starring them. This year's first dish is a Meyer Lemon Cheesecake. The Meyer lemon comes from China and is thought to be a cross between a lemon and a Mandarin orange. After making many cheesecakes this recipe is a winner! It's creamy and rich and wonderful! We chose to make it in two smaller springform pans but you can certainly make it in one larger pan. 2. Combine gingersnaps and melted butter in a blender or food processor and run until gingersnaps are crumbly. Press mixture firmly into the bottom of two 6” Springform pans coated with cooking spray. Bake for 15 minutes; cool on a wire rack. 4. Pour the filling into the two Springform pans. Do not fill to the very top as the mixture expands a little bit. If you have a small amount of mixture left over just bake it in a small baking dish. 5. Fill an 11”x13” (approx.) pan with water and place on a lower rack in the oven. On the middle rack, above the water pan, place the two Springform pans. Place in 300* oven for 1 hour and 10 minutes. After 35 minutes, reverse the position of the two pans if they are in two different areas of the oven, such as one in front of the other. 6. Turn the oven off and leave the cheesecakes in the oven for another hour. Remove from oven and cool to room temperature on a wire rack. 7. 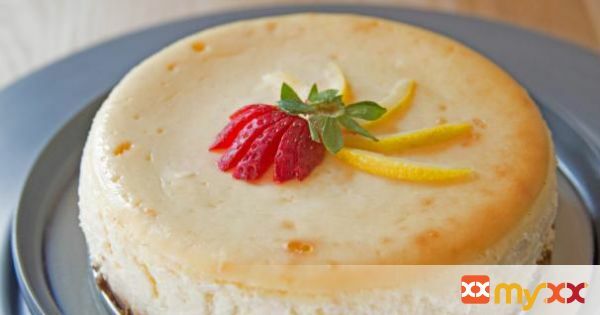 When cheesecakes are at room temperature, place them in the refrigerator for 8 hours or overnight. 8. Before removing from pan, use a knife to cut around the pan sides. Then open the clasp on the Springform and release the cheesecake. Place it on a serving plate with the bottom of the Springform pan underneath.